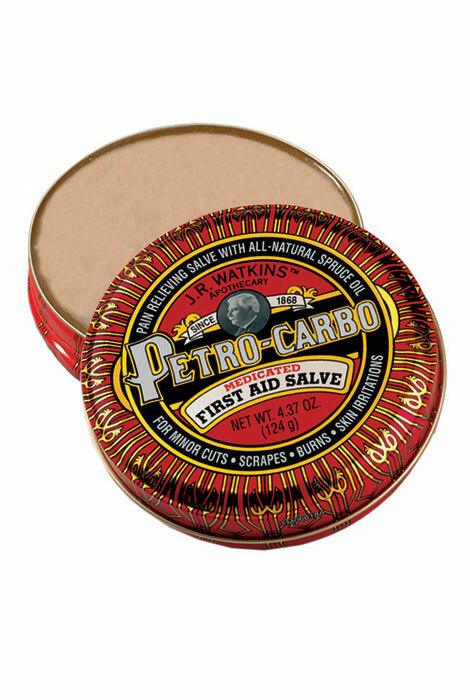 Watkins™ Petro Carbo Salve, invented in 1888 by the J.R. Watkins Medical Company, has been relied upon for generations. This uniquely formulated topical analgesic has spruce, camphor and cajeput oil. Relieves pain and itching of minor cuts, burns and various skin irritations. Works to draw out slivers. A medicine cabinet shouldn't be without this protective Petro Carbo Salve. 4.38 ounces. Phenol (1.5 %) (Analgesic) Cajaput (Melaluca Lucadendron Tea Tree Oil), Camphor Oil, Paraffin, Rosin (Partially Hydrogenated), Petrolatum, Spruce Oil. My grandmother, 97 years of age, used this on us as children, and always kept a tin of this around to help us with drawning foreign items from our bodies, such as splinters, glass, etc. I've searched for years for this and never had any luck until now. Thank you! I have used this product for many years and would not want to be without it, A great product which was also used by my grandma. Does Petro Carbo still come with Carbo acid in it? BEST ANSWER: Thank you for your question. We have included below the complete list of ingredients for this item. We hope this information will be of help to you.